We strive to ensure that all students learn in a respectful, challenging and collaborative environment. Awbrey Park is a thriving neighborhood school in North Eugene that focuses on the whole child. We value parent involvement and collaboration. Our teachers, counselor, administrator and support staff excel in teamwork and a child centered approach to elementary education. 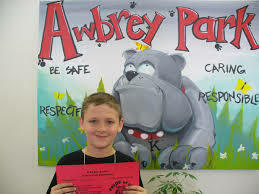 The Awbrey Park academic program focuses on 21st century literacy, math, science and a hands-on, minds-on approach to learning. We are an AVID school that is preparing students for a successful future. The integration of technology is key to our rigorous and engaging classrooms. Our students know that our staff believe in them and can assist them to make academic and social gains in their progress through school. Travel north on River Road. Turn right on Spring Creek Drive. Awbrey Park sits on the right side of the street about a block and a half down the road.